Our team of skilled chandlers have created something truly unique in our refined Cognac scent. This complex medley combines bergamot and amber to form an opulent and dense base note, while notes of apricot, pear and orange blossom add lively and evocative top notes, for a perfectly balanced and invigorating fragrance. Ideal for the lounge, bedroom, study or home office, the fragrance boasts a subtle masculinity that helps to create a neutral and elegant ambience in any room. The earthy and somewhat oriental fragrance of amber marries well with the rich, zesty aroma of bergamot, and the complete bouquet is elevated by brightening notes of vineyard flowers, and the freshness of ripened pear and apricot. 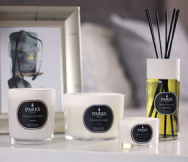 Our Cognac fragrance is part of the Parks Aromatherapy collection, a range of subtle and balanced scents designed to aid relaxation and invoke a sense of peace and wellbeing in any setting. Each tot-sized candle in this luxury gift set has a 20 hour burn time, helping to deliver up to 60 hours of true, long-lasting fragrance throughout your home – for the ultimate in sophisticated relaxation. Our commitment to using only the finest ingredients to create our luxury candles and home fragrances mean you can enjoy natural and well-rounded scents that last.